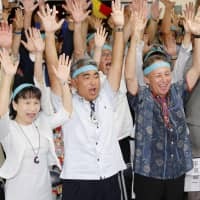 It is impossible to put a price tag on all the pain and suffering inflicted on people as a result of the March 2011 meltdowns at Tokyo Electric Power Co.’s Fukushima No. 1 nuclear plant. The ongoing crisis has created more than 140,000 wandering “nuclear refugees,” has stripped farmers and fishermen of their livelihoods, and continues to expose hundreds of plant workers to daily health risks as they battle to contain the radioactive water accumulating in leaky storage tanks and pipes and flowing into the ocean as groundwater, as well as other hazards. The monetary cost alone is immeasurable because the crisis is far from over and the decontamination of areas hit by the radioactive fallout is way behind schedule. Just neutralizing the three reactors that suffered core meltdowns and the other reactor whose fuel pool looms as a major danger will take decades. But one thing is clear: the final tab will be huge, and the public will end up paying for it, either through taxes or utility bills. While estimates vary, the total cost will probably top ¥10 trillion — or 20 percent of what the central government collects every year through taxes, experts say. 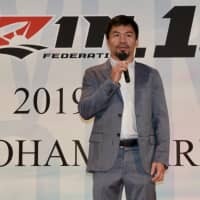 And last month’s pledge by Prime Minister Shinzo Abe before the International Olympic Committee in Buenos Aires that the government will take the lead in bringing the crisis to an end, somewhat, in time for the 2020 Tokyo Olympics could mean additional financial burdens placed on taxpayers. This has led to mounting calls in recent weeks, from academics and lawmakers, and even within the ruling, pro-nuclear Liberal Democratic Party, that the government should force Tepco into bankruptcy. Doing so, they say, is also the only way for top management, as well as creditors and shareholders, to shoulder some of the blame for the fiasco at the inadequately defended coastal complex. Others in the ruling party, meanwhile, propose splitting the utility into two parts, separating the profit-making power generation business from the unprofitable crisis-containment. Tepco, which posted a ¥326.9 billion net loss in fiscal 2012, has stayed alive under a state-backedbailout scheme. 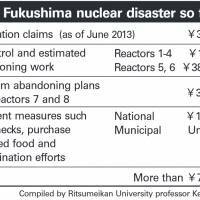 Through the Nuclear Damage Liability Fund, set up in September 2011, the firm has secured ¥5 trillion in public funds and is under effective government control amid enormous damages claims. 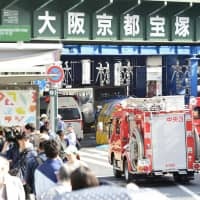 As of June, the utility planned to pay an estimated ¥3.9 trillion in compensation, according to papers submitted by the fund and the utility to the government that month. In addition to compensating victims of the disaster, the nation’s biggest utility also bears the main onus of containing the radioactive water used to cool the damaged reactors, as well as the technologically daunting task of scrapping the stricken plant. “Tepco is a private company, earning profits and listing its stock on the market,” said Masatoshi Akimoto, a Lower House LDP member. A rookie politician first elected in December, he heads a small study group with colleagues on the nation’s energy policy. Akimoto acknowledged that his views are well outside the LDP mainstream. 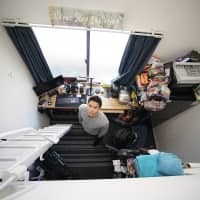 Still, he argued that the bankruptcy filing is the only way Tepco can be held accountable for its failure to bolster the plant’s disaster defenses, when the risks the facility faced were no mysteries. If Tepco goes under, he said, shareholders and creditors will also pay for the risks in investing in a nuclear plant operator. Their shares would plummet and they would be forced to lose much of their outstanding loans to Tepco. Management would be sacked and the utility’s remaining assets would be sold off — saving “trillions of yen” for taxpayers, Akimoto figured. The reality, however, is that the government is trying to prevent Tepco’s failure at all costs, by introducing new accounting rules that smack of “window-dressing,” fumed Kenichi Oshima, a professor of environmental economics at Ritsumeikan University in Kyoto. On Oct. 1, the Ministry of Economy, Trade and Industry released new accounting rules for the nation’s utilities whereby Tepco can now continue to report the six reactors at Fukushima No. 1 as assets, while booking depreciation reserves for the reactors over a 50-year period, even though four of the reactors will never run again, and the other two, anyway idled, face mounting calls for decommissioning. Under previous rules for reactors whose operations had stopped prematurely, the utility had to report depreciation costs yet to be booked as a one-time extraordinary loss, which meant Tepco would have gone belly up under massive debts. METI’s rule changes have made it possible for Tepco to attach all future decommissioning costs onto utility bills. The move came after three meetings, between June and August, by a panel of experts within the ministry — with little public discussion and no deliberations in the Diet. Oshima estimated that the disaster has so far cost over ¥7.4 trillion. 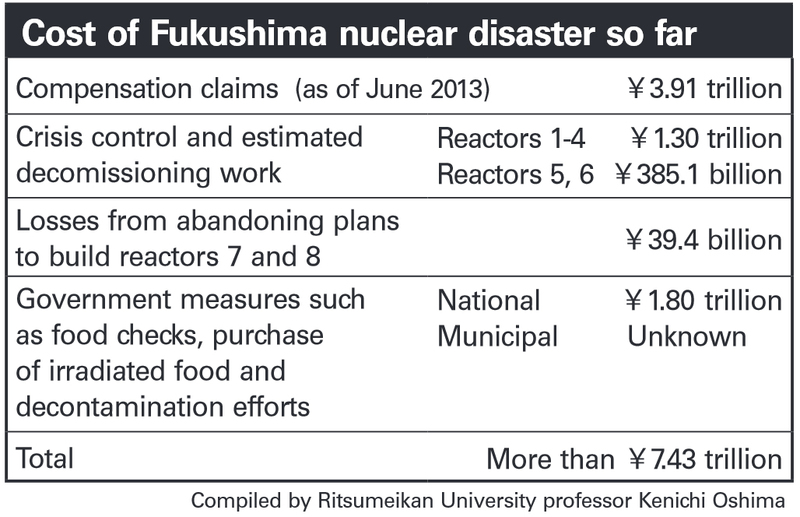 (See table) The scrapping of the damaged reactors, for example, could end up costing more than what is budgeted for now, as the current estimates are based on the assumption that the reactors undergo decommissioning after normal operations, he said. Oshima said it is hard to estimate the total cost for the decontamination work, because it depends on how thorough the cleanup will be. But according to a 2011 estimate by the nonprofit group Citizens’ Nuclear Information Center, if all the affected land, roads, farms and forests are decontaminated, not just in Fukushima but also in “hot spots” in surrounding prefectures, the total cost will reach ¥28 trillion. The government’s bailout of Tepco comes with serious problems, Oshima argued, because it has effectively turned the nuclear power industry into a risk-free one. 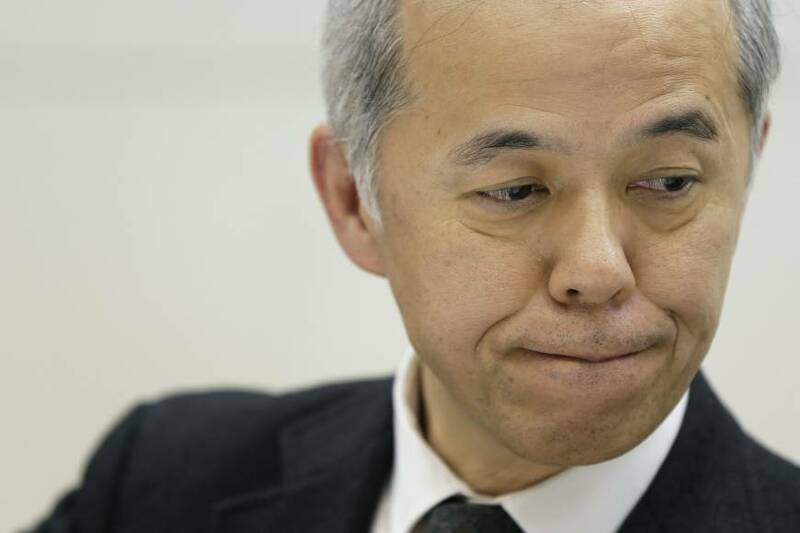 Tepco needs to exist until it pays off all the compensation claims, Yamamoto said. 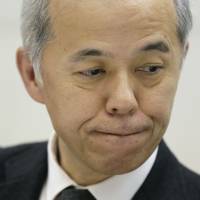 If the government forces Tepco to go under, the state will be sued for compensation by creditors and shareholders and thus be embroiled in a drawn-out court battle, Yamamoto said. Oshima, while agreeing that the demise of Tepco alone will mean a loss of an institution through which compensation can be made, claimed the current arrangement is unhealthy. JAL rehab a lesson for possible Tepco failure?